The End is the third and final dimension in Minecraft and can only be accessed by finding the End portal. Not only are End resources (ender pearls, eye of ender, ender chests, etc.) important to help you advance through the game, but they also provide some unique capabilities to make your experience more enjoyable. Learn more about what an ender chest and the eye of ender can do for you. What is an Ender Chest? In Minecraft, an ender chest holds items just like normal chests, but shares that inventory with other ender chests that are placed anywhere, including in other dimensions such as the Nether or the End (the inventory is only available to the player who created the chest). When an ender chest is broken, its items do not drop like they do with normal wooden chests. Instead, you can retrieve them at another ender chest in your world or by simply creating a new ender chest. The benefits of an ender chest outweigh the resources required to build them. For example, you can stockpile items that are easily accessible at all bases or houses. Though ender chests are explosion-resistant (another advantage over standard chests), you can break them with a pickaxe or ender dragon if necessary. Ender chests don’t work with hoppers, droppers, command blocks, or pistons. They’re treated as inventory of the player and not as a block. The only downside is that an ender chest is far more difficult to make than a chest, requiring blocks of obsidian and an eye of ender. Obsidian can be mined at places where water meets lava throughout the game. It can also be obtained on the Nether Portal, or in unlimited form in The End region on the platform that is created each time you enter The End. If you have access to obtain blocks of obsidian at an efficient rate, it is recommended that you use ender chests over regular chests for resource storage and access. The Eye of Ender has multiple uses for Minecraft players. First off, the item is an actual ingredient used to craft other items, such as the ender chest shown above. It is also an item that can be crafted by the player, if you have correct ingredients. 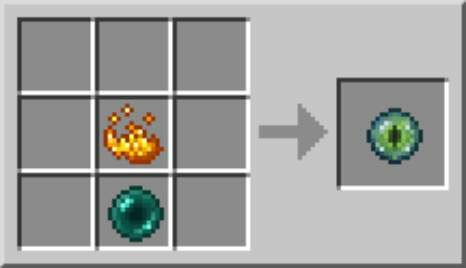 To craft the eye of ender in Minecraft, you need to collect a blaze powder and an ender pearl (dropped by Endermen when they die). 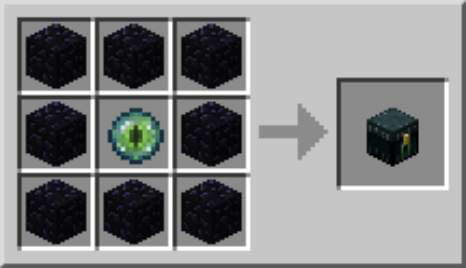 Simply place both ingredients anywhere on the crafting grid and you have now made the eye of ender! Not only is the eye of ender critical for end-game crafting, but more importantly, it is used to help players locate and enter end portals. To locate an end portal, simply hold and right-click the eye to send it into the sky. After performing this action, the eye will move toward the portal and leave a trail of purple dust for you to follow. After you find a portal, 12 eyes are required to activate it and transport your character to the final dimension of the game.